Ambrosini Jewels are result of a careful details’ study . All strictly MADE IN ITALY. 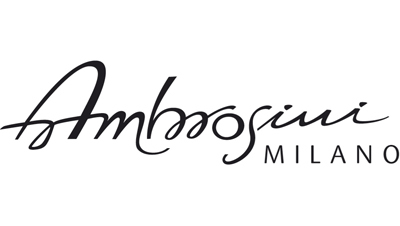 Ambrosini Milano's creations reflect the company's philosophy, it is attentive to the needs of its clientele and mindful of market changes, while solidly based on over a decade's experience in the field. Original CUP pendants are not only a jewels but also an instrument to be used to communicate personality: a sweet puppy or the imprint of a paw for pet lovers, a heart to show its affection, a star because the way you drive under the sign of luck or even a shoe for the most romantic or for those who never loses view of elegance. The elegant and original Ambrosini Jewels’ touch id done by SPOONS line: greedy small spoons as if secretly dipped into a tasty honeypot. The jewel's uniqueness is reflected in the gourmet gift it comes with: a truly special jam will delight your taste buds with strong hints of pear and cinnamon, with the tantalizing combination of strawberry and orange. Ambrosini elegance cannot miss into its packaging: a wooden box and the opalescent icy white of the lid, the original packaging reminiscent of icicles comes to life; a truly unique packaging for a special jewel. GET THESE UNIQUE MADE IN ITALY JEWELS!